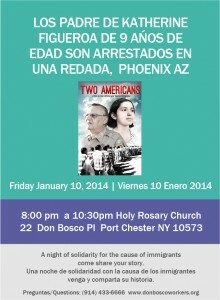 Don Bosco Workers Hosts Screening of “Two Americans”:Don Bosco Workers Inc.
Don Bosco Workers and Holy Rosary Parish will host a free screening of the award winning documentary, “Two Americans” on Friday, January 10th, 8-10:00pm, at 22 Don Bosco Place, Port Chester, NY. Despite renewed efforts by advocates to pass an immigration reform bill early in 2014, deportations continue to spiral. Estimates are that 200,000 immigrant parents of U.S. citizens have been deported since 2010, leaving thousands of broken families in their wake. “Two Americans” tells the true story of Katherine Figueroa, the 9-year-old daughter of an immigrant parents who are arrested during a workplace raid by police at a car wash in Phoenix. As child and the community join together to challenge Arizona’s draconian immigration practices, they end up exposing large-scale corruption among local law enforcement. 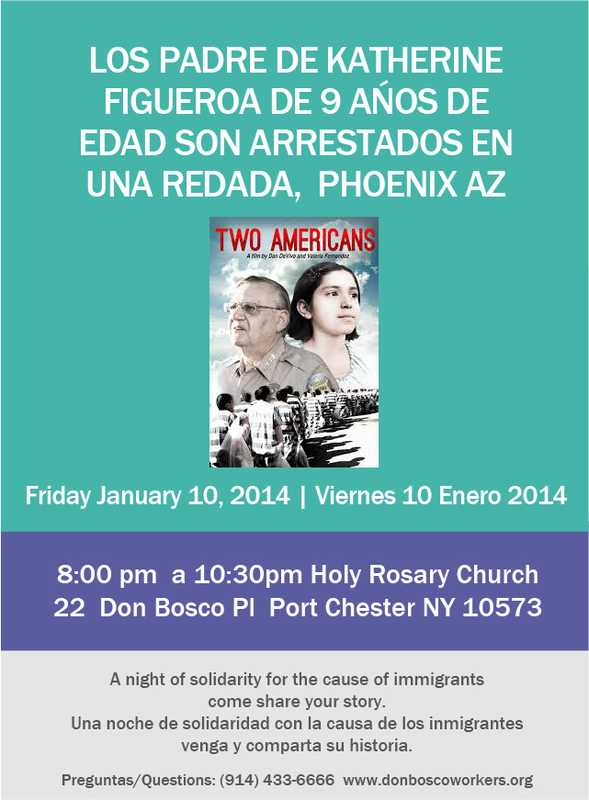 “Two Americans” places a human face on immigration reform and redefines deportation as a human rights issue. Screening to be followed by open-mike with the audience and a chance to share personal stories of hardship and broken families under the present immigration law. No reservations necessary.